Happenings in Aspen | Aspen Snowmass Real Estate :: McKinley Real Estate Sales, Inc.
Aspen’s winter festival dates back to 1951. Winterskol began as a way for locals to shake the mid-winter doldrums as well as pull in tourists during the post-holiday lull. There may not be costumed ski races or parades through town these days, but there is plenty to see and do. The penultimate qualifying competition for this winter’s slopestyle and halfpipe ski and snowboard Olympic teams is happening right now in the terrain park of Snowmass Ski Area. Aspen’s links to the Olympics stretch back to the area’s beginnings as a ski destination, with many former and current Olympians calling Aspen home. The Wheeler Opera House continues its tradition as the entertainment hub of Aspen. 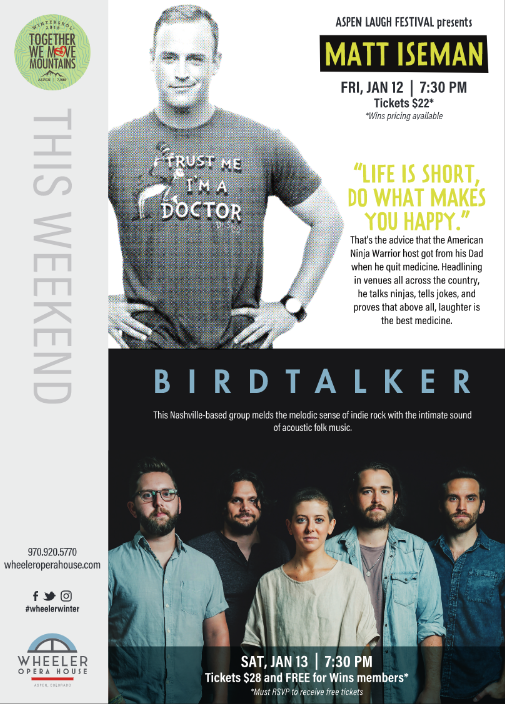 Whether you are looking for a good laugh, or an up-and-coming band, head over to the Wheeler.